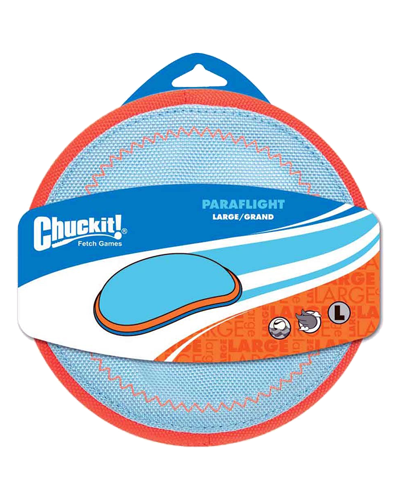 At Uncle Bill’s Pet Center, we not only offer ChuckIt! dog toys for sale, we also employ a highly trained staff that can assist you in finding the appropriate toy for your dog. It’s a bird, it’s a plane, no it’s the Chuckit! Paraflight Flyer! Not only does this toy soar high in the sky...it floats, too. Perfect for flinging around the pool, lake or on land. Raised sides picking up this flyer is easy so there’s less doggy slobber to worry about. With the the Chuckit! Paraflight Flyer you and your best friend will have a soaring good time. We will be glad to work with you to ensure that your pet enjoys quality toys for optimal health and happiness by providing the best selection and value on premium dog toys for sale in Indiana.